New Medicare Card Arriving Soon! 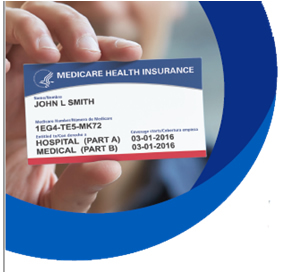 This past month Medicare began mailing out new cards to everyone enrolled in the Medicare program. There are many things to keep in mind while you are waiting for your new membership card, including proper disposal of your existing card once you receive your new one. 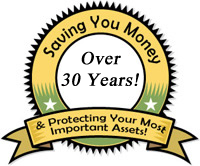 Ensure that you are not compromising your identity or insurance benefits by allowing your social security number to be stolen due to improperly discarding your old card. When you receive your new card – note that your card has a new number instead of your Social Security Number. This new number is unique to you. Only give your new Medicare Number to doctors, pharmacists, other health care providers, your insurers, or people you trust to work with Medicare on your behalf. 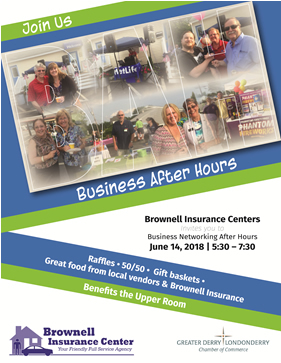 Join us for some fun summer networking, as we host the Derry Londonderry Chamber’s June After Hours event. This has become an annual favorite with plenty of food vendors, entertainment, gift baskets and giveaways, plus raffles, dessert and a Brownell Family Barbecue. All are welcome. Incidents involving dog bites, or even more severe attacks, especially targeting toddlers, are on the rise. Around five million bites are reported every year in North America — 4.5 million in the US and half a million in Canada. Often the problem is that an aggressive dog is not being properly restrained but it’s also true that in a percentage of cases, dogs actually become agitated because of the way a human interacts with them. So, is there anything you can do to cut the risks of a dog attack? According to John Bastian, who works for TV celebrity and “Dog Whisperer” Cesar Milan, the most important thing to do when confronted by an aggressive dog is to remain calm; that tends to slow them down. You should also avoid direct eye contact, standing slightly sideways but keeping the animal in your peripheral vision. 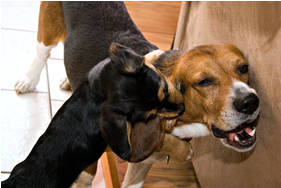 “Once you have successfully used calm assertive energy to keep that dog back… read more here. Young athletes could be risking their health by consuming highly-caffeinated energy drinks to boost their performance. Following a review, the American College of Sports Medicine (ACSM) says the drinks should not be consumed by children before, during or immediately after physical exertion. Reactions can include irregular heartbeats, high blood pressure, anxiety, headaches and insomnia. Pediatricians say children aged between 12 and 18 should limit caffeine intake to 100mg per days — about the amount you get in a regular cup of coffee. There’s nothing quite like a limousine ride to make a splash and a statement at the start of a celebration. But before you rush into booking your luxury ride, you need to be sure the limo hire company is as concerned about safety as you are. Price is less important than the reliability and reputation of the firm — and it’s worth spending some time checking those factors out before making your booking. Conduct an Internet search on the name of the company. What do others say about it? Check ‘Angie’s List’ and the Better Business Bureau. Check the firm is properly licensed, registered and compliant with Government regulations. Check the model, age and capacity of the vehicles. Is there a choice or is it a one-limo operation? How often is it serviced? If you’re not happy with any safety aspect of the vehicle, don’t take the risk. Point out the problems to the driver, request a refund and make alternative travel arrangements. It may seem a bummer but remember people die every year in limo tragedies. Get to your celebrations safe and sound! 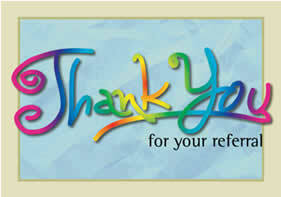 Thanks to all of our clients who graciously referred their friends and associates to our agency! We build our agency on your positive comments!